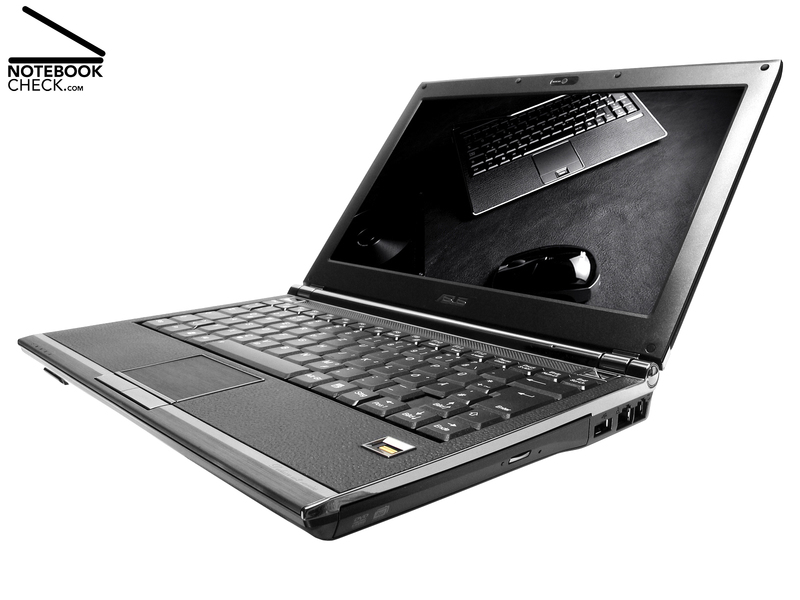 Weighing 1.3 kg, the Asus U2E is a very light noble subnotebook. This exclusive nobel mini notebook has a case of extremely high-quality made of glossy precious metal combined with extravagant black leather. 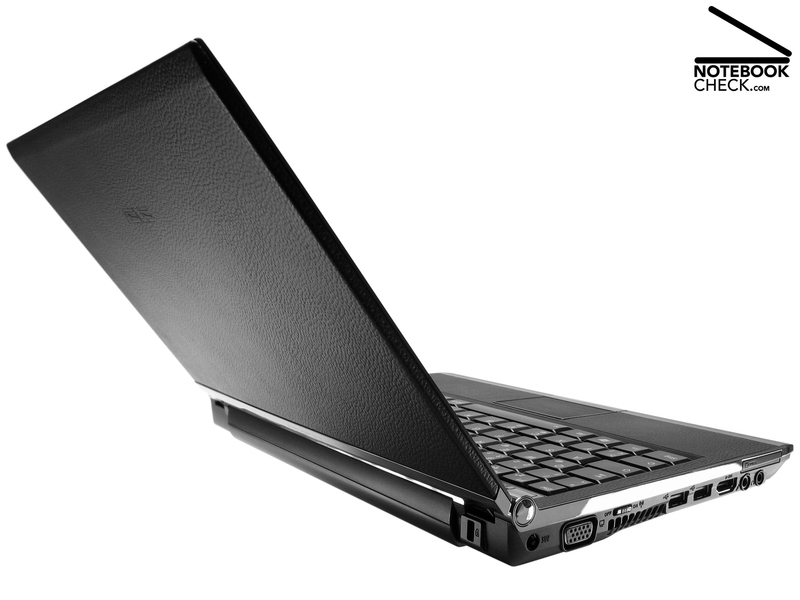 The inside also includes exquisite components: An Intel Core 2 Duo Ultra Low Voltage U7500 processor, a DVD drive and a bright 11" LED LCD. Noble luxury models are nothing new in the category of light and very portable subnotebooks. Whether being used as fancy gadgets by yuppies or as elegant special purpose computers by businessmen who travel a lot, exclusive ultra-portable computers with extremely low weight, noble materials, robust workmanship, and powerful equipment are often available for less than 1500.- Euro today. No wonder that many business customers allow themselves such tiny mobile notebooks. 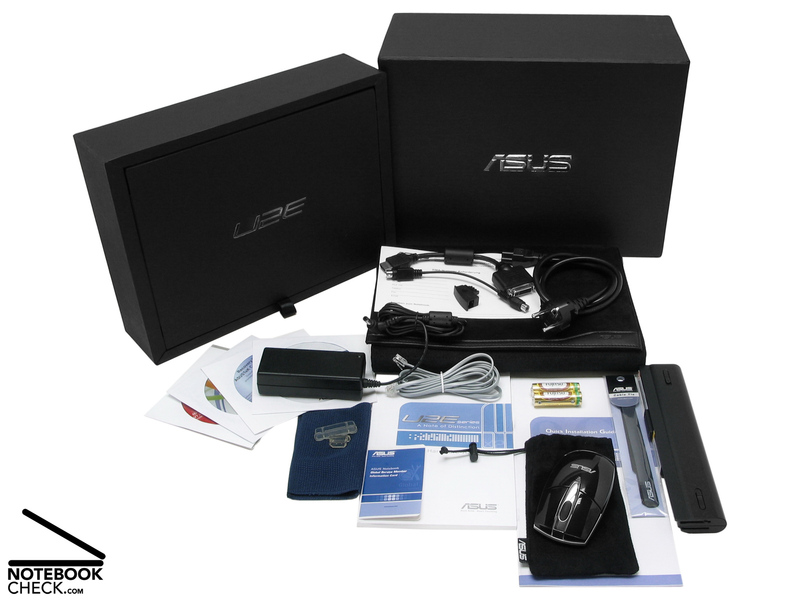 Asus fields the 'U2E', a real showpiece of the noble ultra-portable brand, for acquiring the well-off customers. Thus this exclusive mini by Asus is smaller than an A4 notebook and offers besides up-to-date energy saving components also a very thin super multi drive, which allows to enjoy DVDs on-the-move. How about the workmanship? It's hardly possible to design a nobler notebook. The reviewed notebook attracts attention by black leather and a lot of precious metal. The following review covers what else this notebook features. Already at the time of unwrapping this about 1.3 kg light and with 27.5 cm x 19.5 cm x 2.5 to 2.9 cm very compact ultra portable notebook, the U2E by Asus puts us in a good mood. Bye, bye sadness: Instead of being, alike a lot of competitor notebooks today, sparsely equipped with accessories, we can unpack many accessories for the Asus U2E. 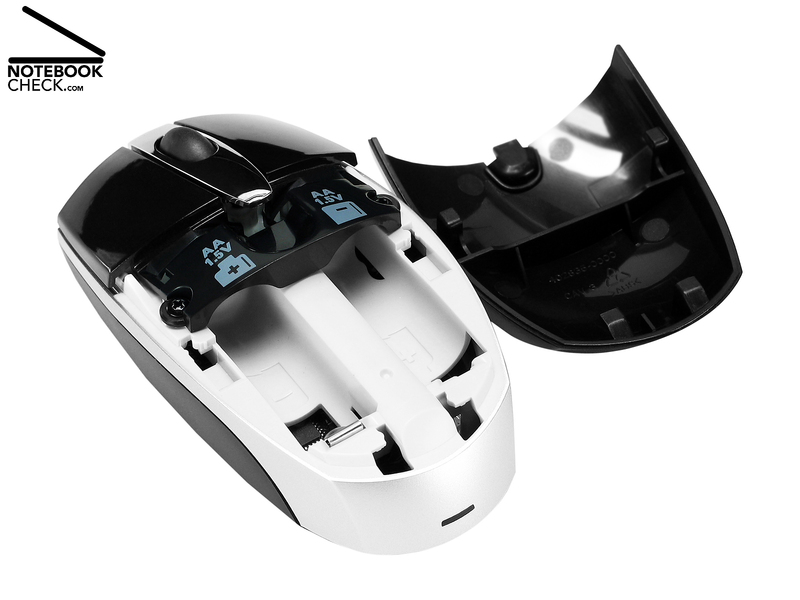 Besides some useful small parts like connection and adapter cables or a microfibre cloth for the display, we also find a Bluetooth mouse and a noble looking notebook bag in the box. Asus even remembered to provide recovery media - super! 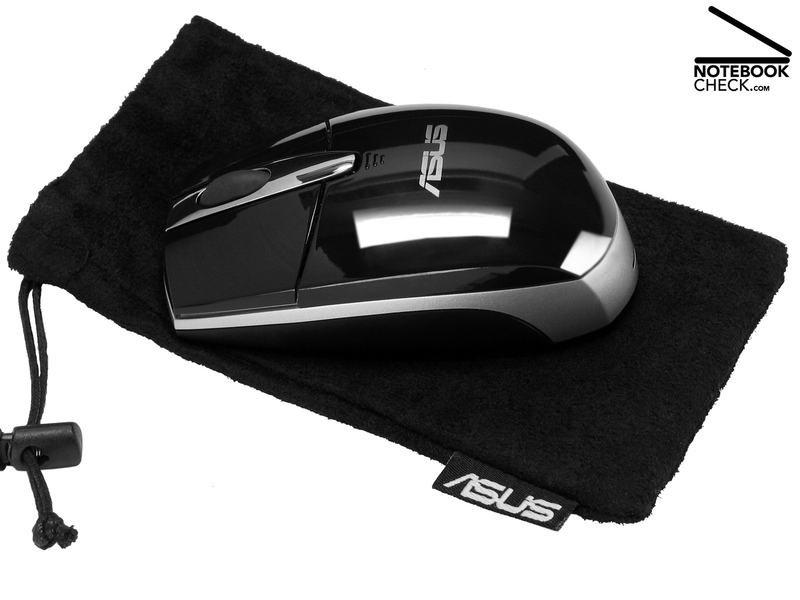 But, also the U2E itself inspires: Really everything of the Asus appears to be first-class and noble. The lid is made of a magnesium-aluminium-alloy and is alike the palm rest areas and the frame around the keyboard completely covered with black cowhide. 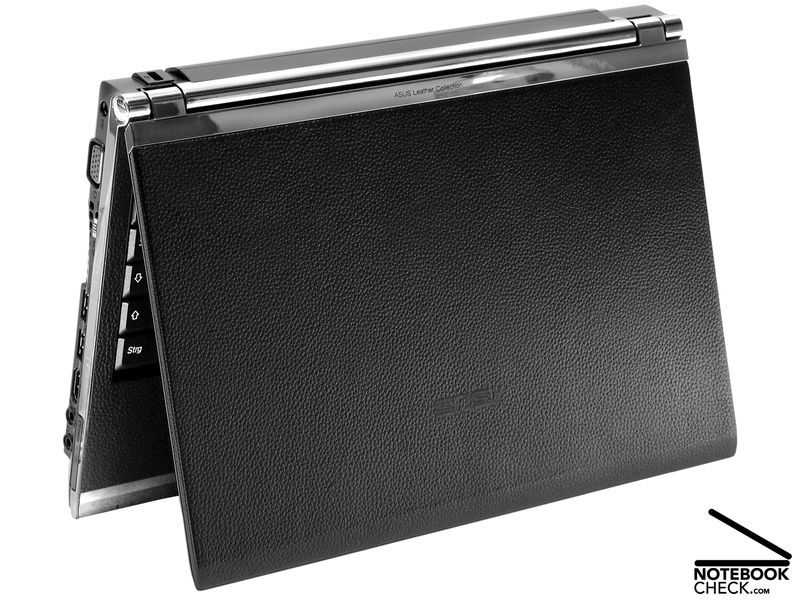 Even the front edge of this subnotebook is due to a brushed metal moulding a real eye-catcher. Furthermore, chromed flowering elements attract attention in the plane or in the hotel lobby. In short: The used materials and the workmanship of the Asus U2E are simply excellent! Only the thin plastic frame around the display does not really match the otherwise noble look of the inside. Even otherwise we cannot criticise the case of this mini notebook in any way. The chassis of the U2E is flexural rigid and feels nice to the touch. The thin lid is not secured by any transport hook, but only be self-closing hinges. If you slightly press your fingers against the backside of the lid, the picture on the powered display stays the same. Unusual: Considering the Asus U2E is a 11.1 inch ultra portable notebook it offers a really multifarious interface and communication equipment. Wired, this noble mite provides fast Gigabit-LAN. Wireless, this piece of juwellery offers transfer rates of up to 300 MBit/s (draft-n) for transfering data via WLAN-N to and from the Internet. If your mobile phone supports Bluetooth 2.0 the Asus U2E and your mobile phone can communicate via Bluetooth. Due to the built-in webcam you can join your friends in a video conference on-the-move at any time. But, this is still not all this small jack-of-all-trades offers. 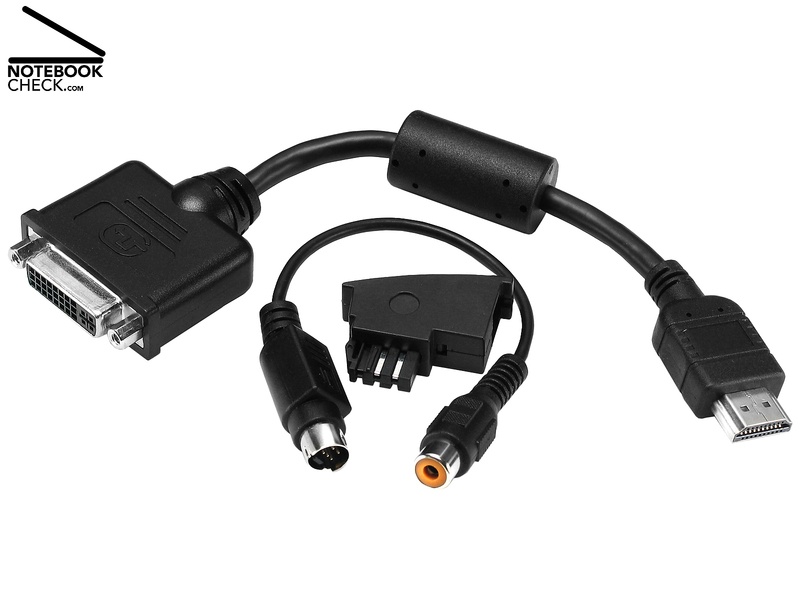 It allows connecting an external flat screen to its micro DVI interface. 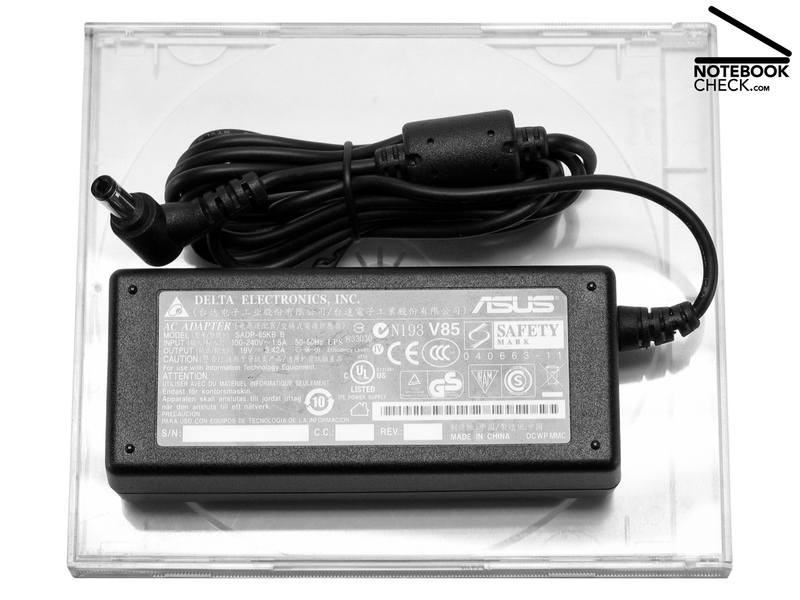 Ideally, Asus even provides an appropriate adapter cable! The Asus U2E is compared to bigger notebooks also not short of security features. 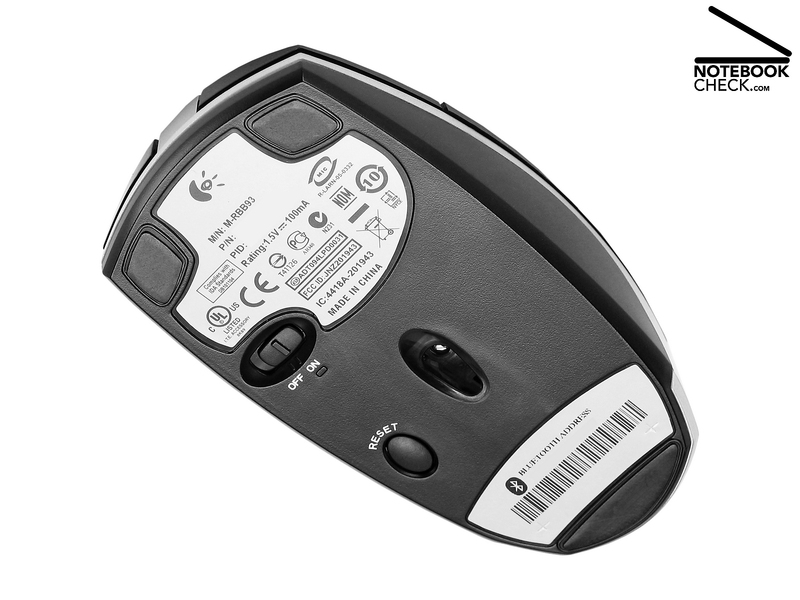 The built-in Trusted Platform module (TPM 1.2) and a fingerprint reader provide for a comprehensive access protection. The 'Power4Gear eXtreme' button and the sliding switch for Bluetooth & Wireless LAN on the side are the only short cuts available. The 'Power4Gear' button allows to quickly switch between different energy profiles. 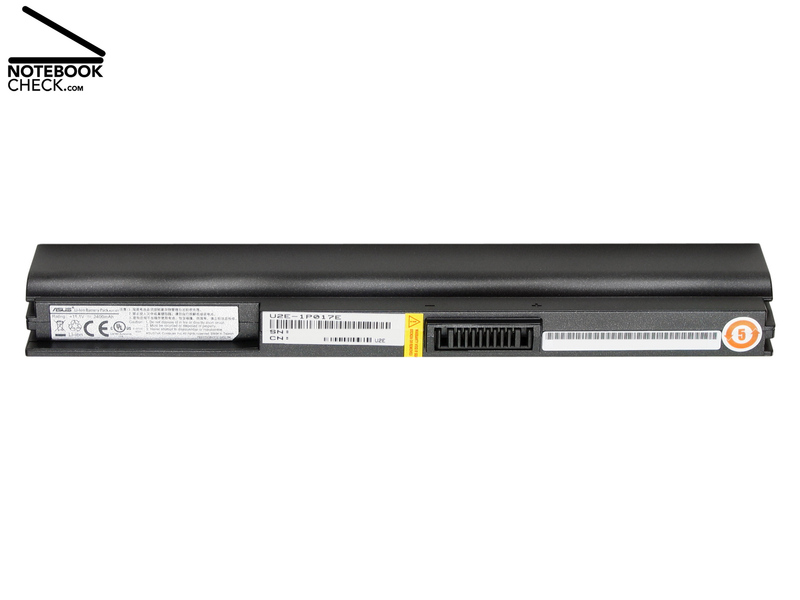 The energy profiles control many functions of this notebook PC in order to maximize the performance or to increase the battery life. 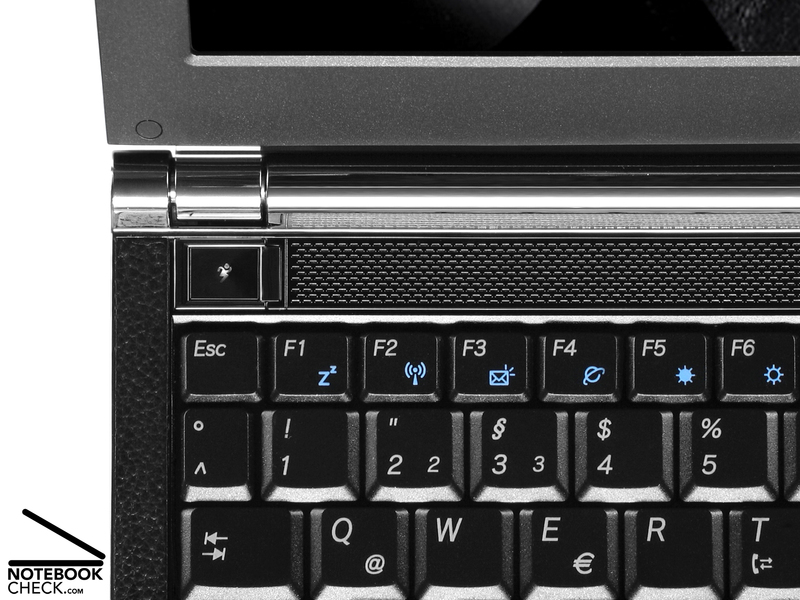 Despite a 11.1 form factor and the, therefore, limited space, the keyboard of the Asus U2E consists of 83 keys. The main keys are 1.3 cm x 1.2 cm and are tightly attached to the base construction. Typing feels nice to the touch and the tapping is relatively quiet. 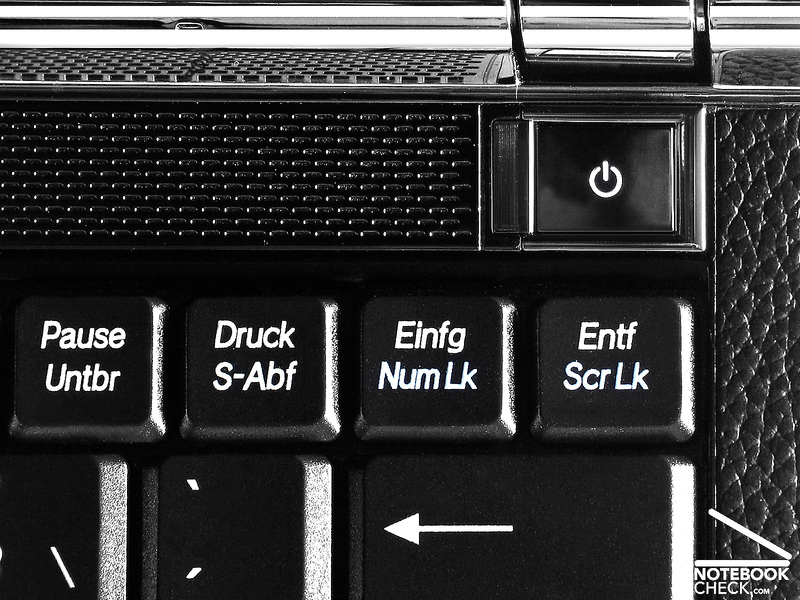 Due to a standard keyboard layout it is easy to get used to the smaller key size. In terms of mechanics the keyboard area is pleasantly stable and gives only insignificantly. 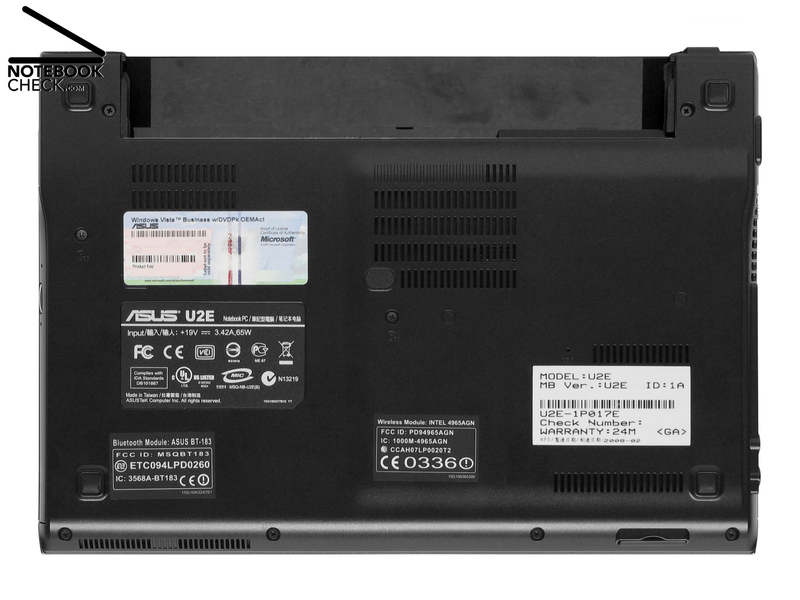 The touchpad of the Asus U2E is, considering it is a 11.1 inch subnotebook, with 5.1 cm x 4.3 cm rather sizable. Its surface feels very nice to the touch. And it works precisely. The slightly roughened surface structure of the touchpad has a very good adhesion. Furthermore, this mouse replacement can be easily deactivated by pressing F9. 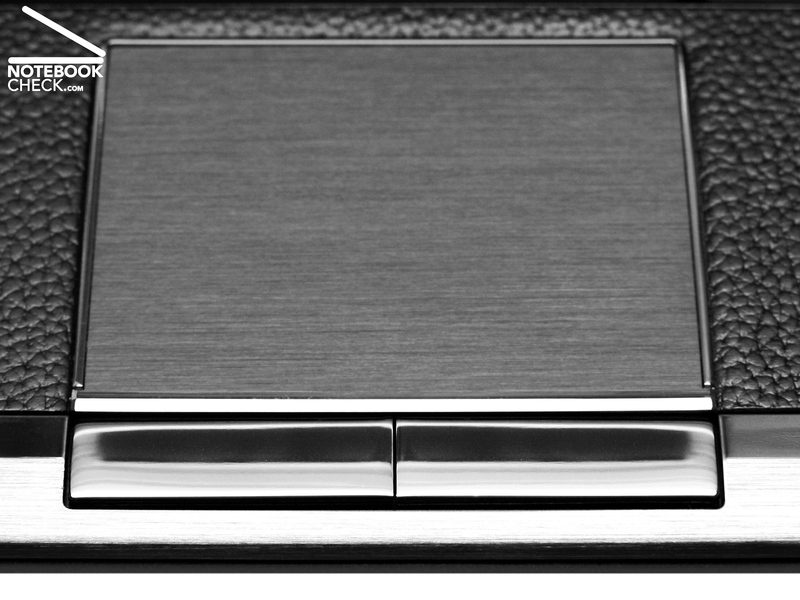 The two big and rectangular touchpad buttons are chromed and score points by being rather quiet. The built-in screen of the Asus U2E is a heavily reflecting 11.1 inch WXGA display with a native resolution of 1366 x 768 pixels. 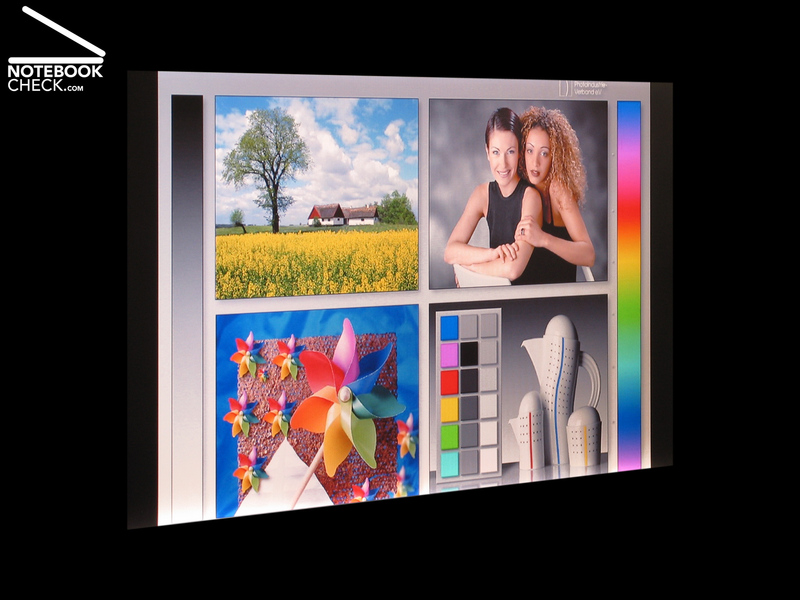 This glare type LCD (Color Shine) comes with an energy-saving LED backlight. 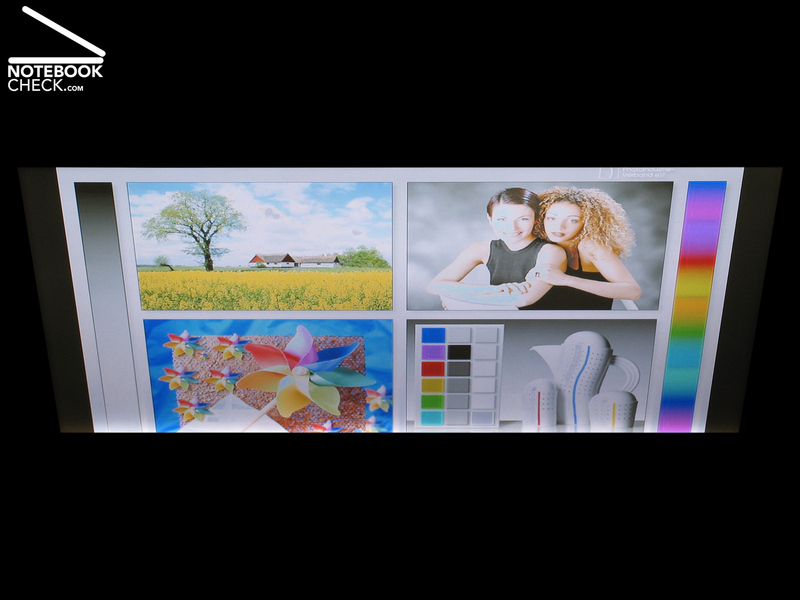 This wide screen achieved an average brightness of 194.4 cd/m² in the brightness measurements. So, the display should even be legible outdoors - at least if you work in the shade. 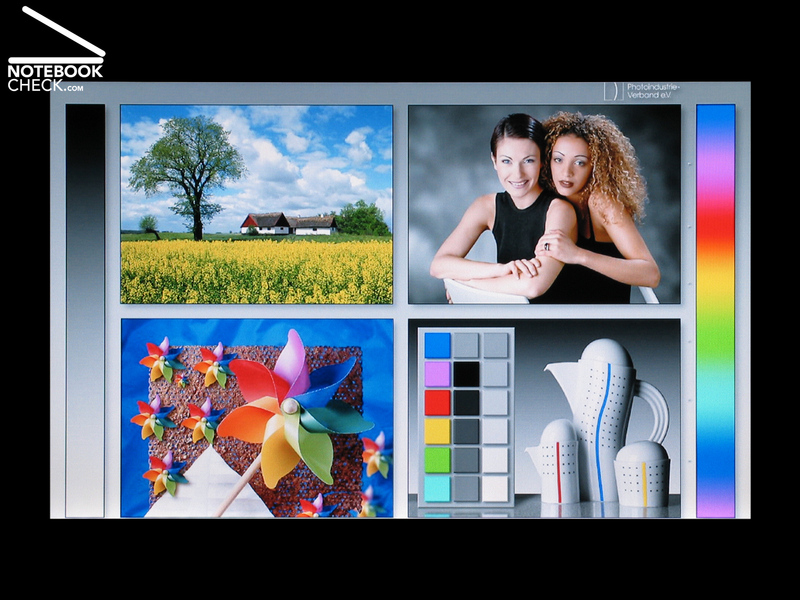 Regarding contrast our Asus U2E is very good. A measured minimum brightness (black value) of 0.4 cd/m² and a maximum brightness of 204.5 cd/m² gives a high contrast value of 511:1 in mains operation. Also the very even illumination is very good. 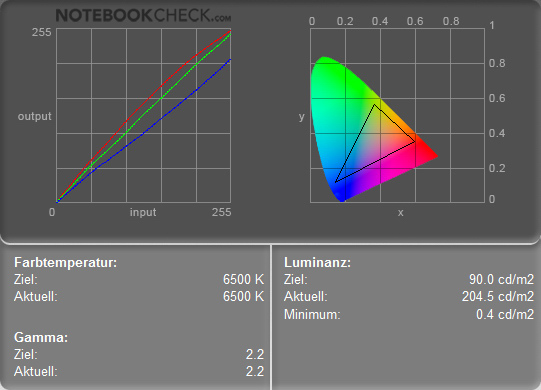 The illumination of 91.7% for the reviewed notebook is absolutely great. The brightness of the brightess area (in the middle of the screen of 204.5 cd/m² and of the darkest area (right upper area) of 187.5 cd/m² deviate only by 8.3% - super! Also the subjectively you'll hardly detect any streaks if you display different bright background on this screen. The viewing angles of the Asus U2E are just average. 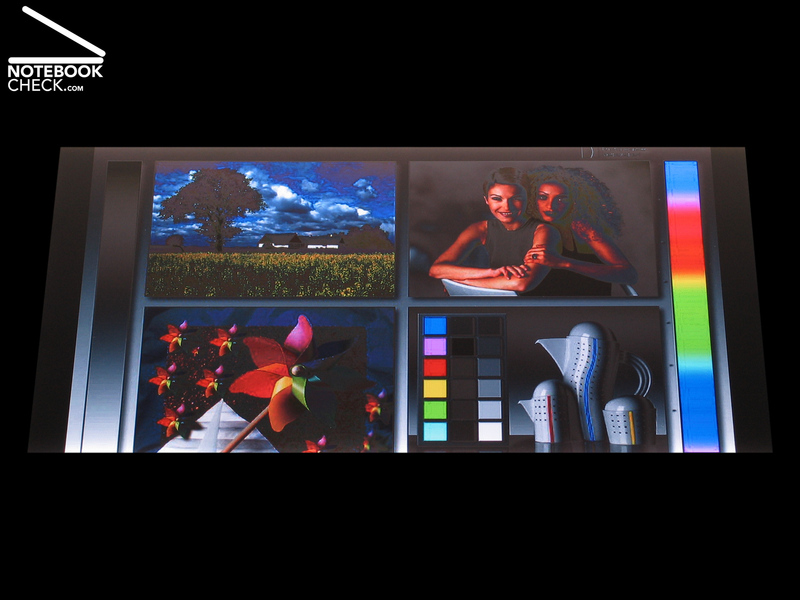 But, we liked how this WXGA display did directly compared to our reference screen - a high-quality 20 inch MVA-LCD Viewsonic VP2030b - in our subjective rating of the reference pictures. Contrast and Brilliance are no point of critique. So, multimedia and office work are no problem with this 11.1 inch LCD. 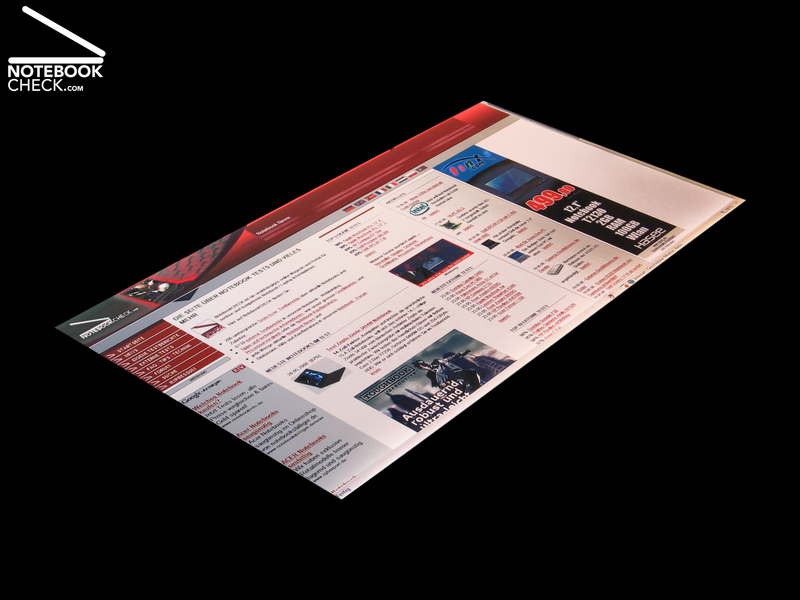 Admittedly some users might first get used to the small size of this 11.1 inch TFT. Despite most up-to-date core components, the Asus U2E is not tuned for top performance. In fact, being a genuine ultra portable computer, the Asus U2E should work very energy-efficient while providing a passable total performance. 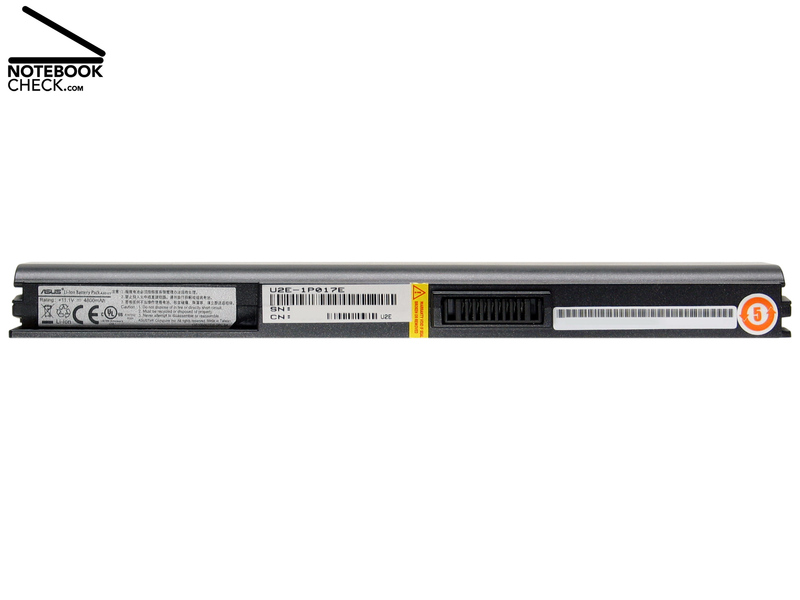 Equipped with Intel's energy-saving CPU, a Core 2 Duo Ultra Low Voltage U7500 (1.06 GHz, 533 MHz FSB, 2 MByte L2 cache) and integrated GMA X3100 video chip the Asus U2E is also very successful in this aspect. 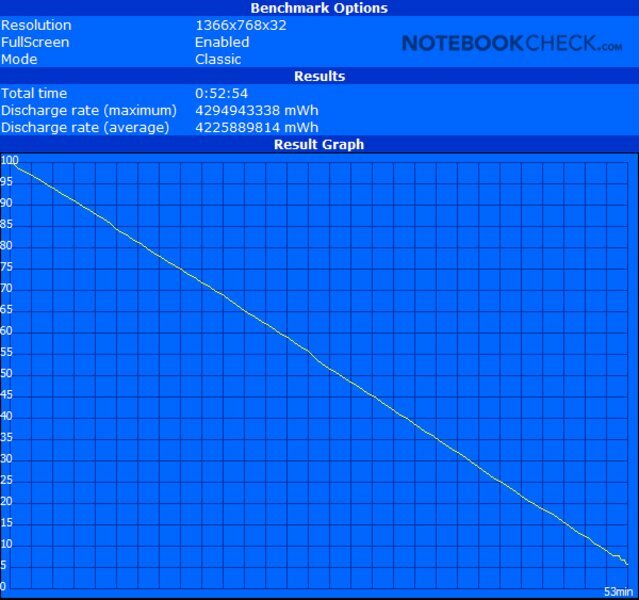 It achieves 2212 points in the PCMark05 benchmark and, so, has a satisfying applications performance. 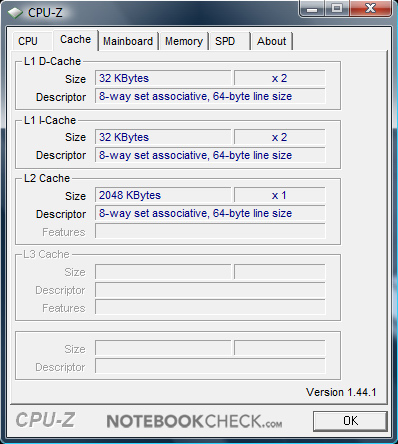 CPU-Z Information of the Asus U2E 1P017E Subnotebook. 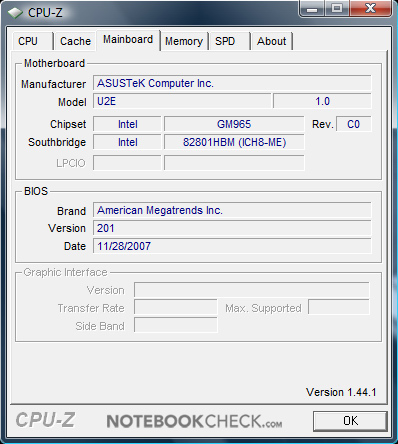 Basically the Asus U2E has also no problems with Microsoft Windows Vista Business. 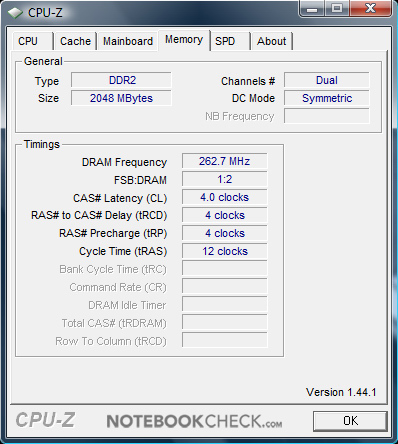 After all two GB RAM (2x 1024 MByte DDR2-667) allow a smooth work under Vista. 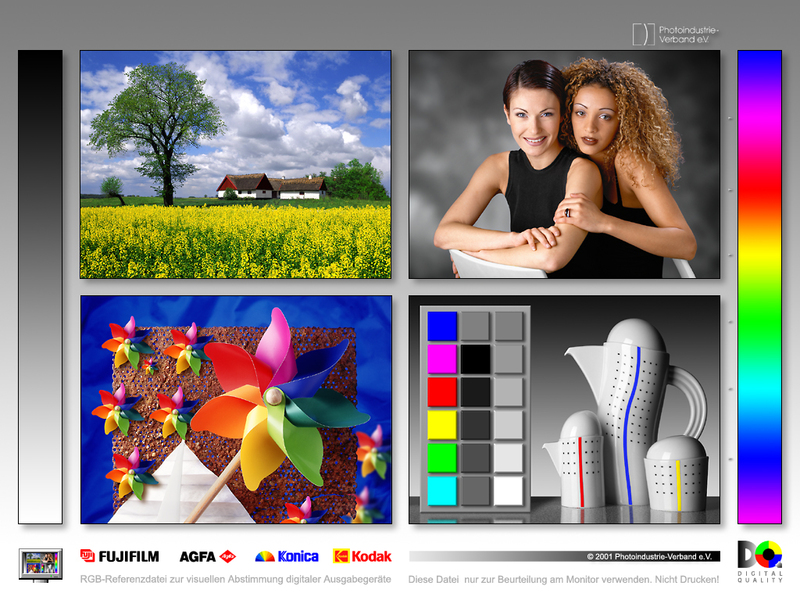 Simple graphics and multimedia applications should also run without problems. Anyhow, nobody would dare to run demanding and calculation intensive tasks on an ultra portable PC. The total performance of the Asus U2E is at least sufficient for working on-the-move. But, there might be some delays last but not least because of the slow 120 GB hard disk (HDD). The integrated video chip, a GMA X3100 by Intel, suffices standard office work. Admittedly, the 3D performance of the X3100 is very limited. 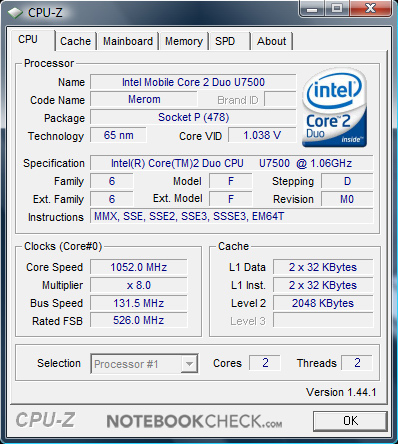 The Asus U2E achieves with the Intel driver version 7.14.10.1283, e.g., only 426 points in the 3DMark06. 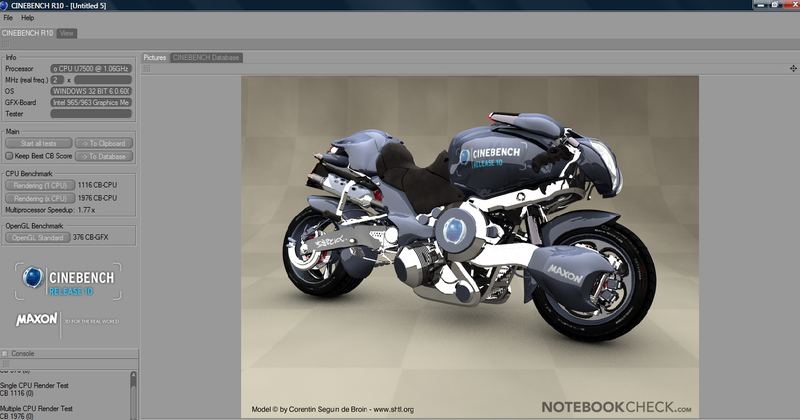 The shading test of Maxon's Cinebench R10, where it achieves an CB-GFX value of 376, does also not attest the X3100 top performance. 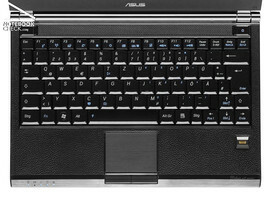 The small ultra portable Asus U2E comes at least with a 120 GB 1.8 inch PATA hard disk, a Spinpoint HS122JB by Samsung. This mini 1.8 inch hard disk weighs only 59 gramme (!) and is thus feathery. 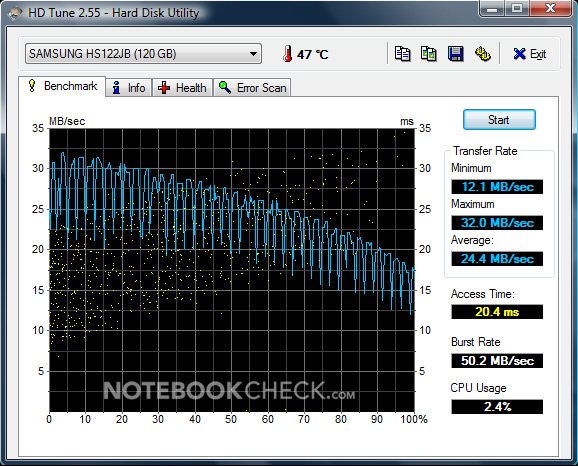 However, this 4200 rpm hard disk achieves only a transfer rate of 24.4 MB/s in the hard disk benchmark HDTune, which is a weak average data transfer rate. 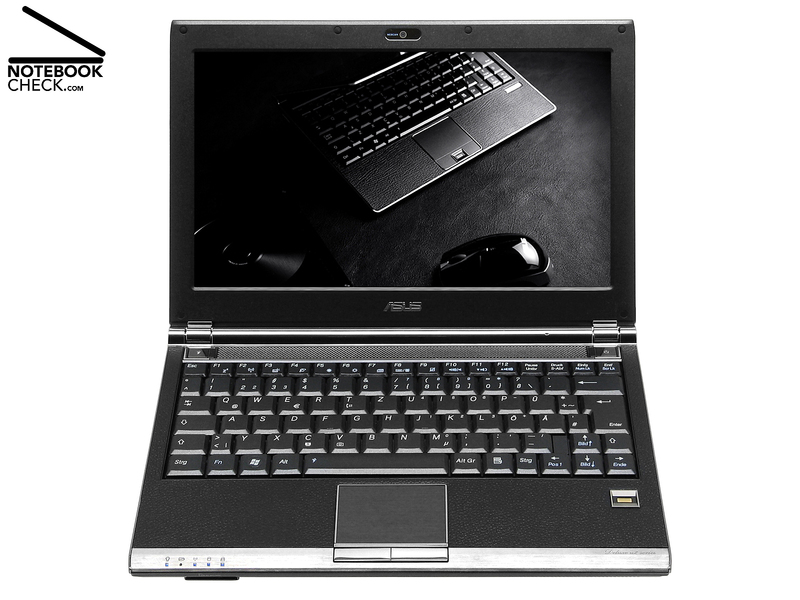 However, this tiny Asus notebook is also equipped with an ultra thin 8x DVD burner, an GSA-U10N by LG Electronics, which makes DVD entertainment on-the-move possible. 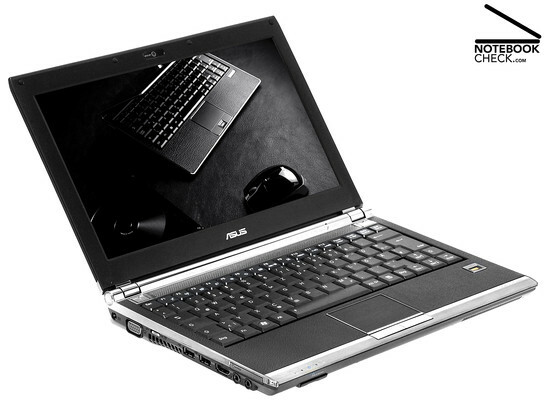 Considering the Asus U2E is an ultra portable notebook, it offers with Intel's Graphics Media Accelerator X3100 (GMA X3100) more than many other netbooks do. 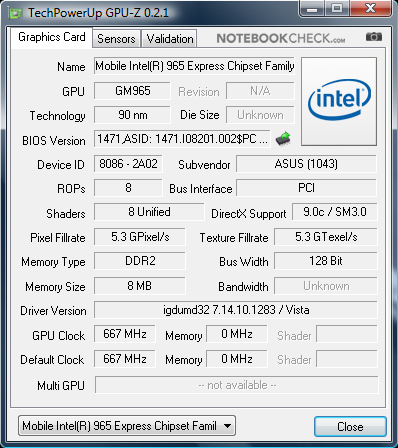 Of course the GMA X3100 does not turn the Asus U2E into an ultra mobile gaming bomb. The main design goal which lead to choosing a GMA X3100 for this notebook was to save energy and space inside this small subnotebook. To summarize, the 3D performance of the GMA X3100 suffices older or less demanding games on low resolution. However, in the 3DMark2003 the GMA X3100 achieves only 1190 points. So far, we could not really find any disadvantage of the Asus U2E. However, this changed as soon as we began to check its system noise, because it turns out that the Asus U2E is not really a quiet companion. As soon as the performance demands increase a little bit, the fast running fan gets loud. However, due to the small size of this 11 inch portable computers this is no surprise. 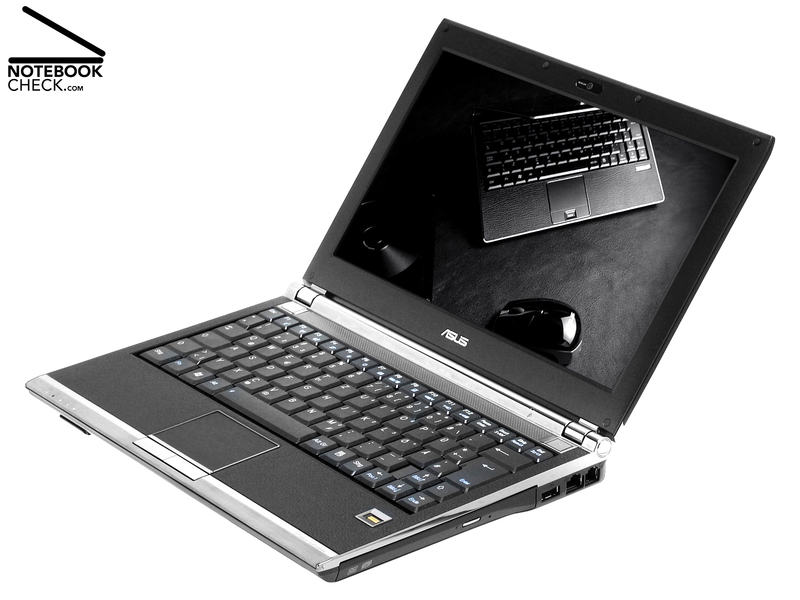 E.g., the Asus U2E has, considering it is an ultra portable notebook, a convenient total performance and many additional features, e.g., a DVD drive. 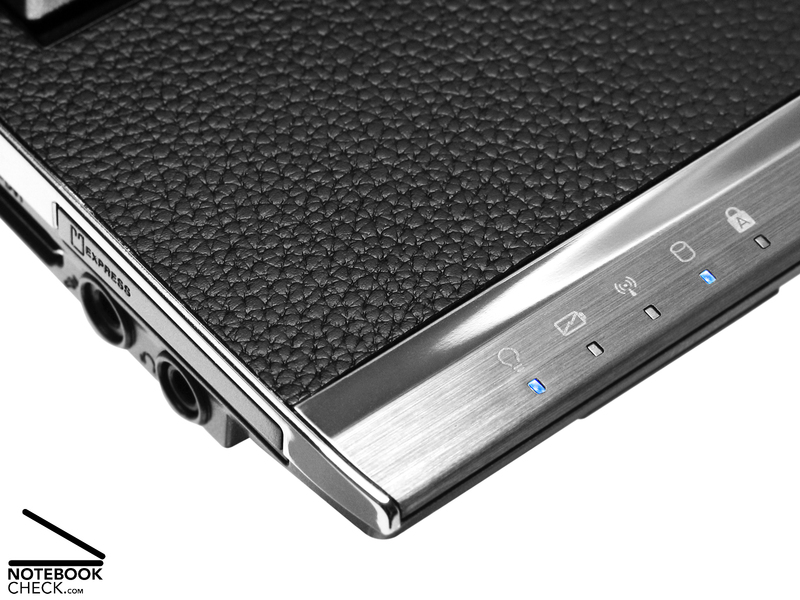 The Asus U2E is even audible while idling, where we measure a noise level of up to 35.3 dB(A). If the load increases a little bit, e.g, during browsing TV web sites with the usual colourful advertisement fireworks, the noise level of the Asus U2E increases to up to 37.4 dB(A). Sensitive ears will likely be annoyed by this constant noise. However, the user can help reduce the noise a little bit, by decreasing the performance via the 'Power4Gear' button. Depending on the ambient temperature, the Asus U2E turns down the revolution speed of the fan afterwards. At top performance the auditory nerves have to stand loud 46.5 dB(A). 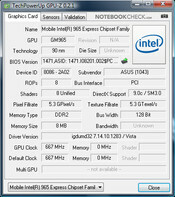 Because of the 11 inch size and the crowed inside of the Asus U2E also the temperature characteristics are no surprise. At the top side we measure a maximum temperature of 38.1°C on the left palm rest area. 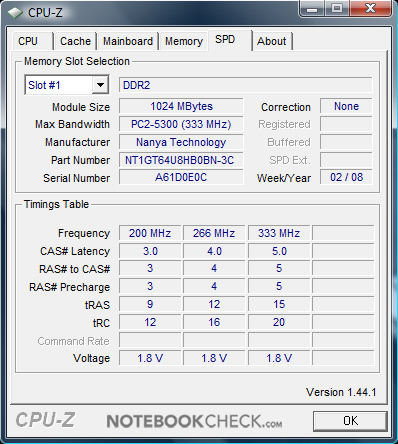 The average temperature of 33.3°C is, nevertheless, good for a subnotebook of this performance category. 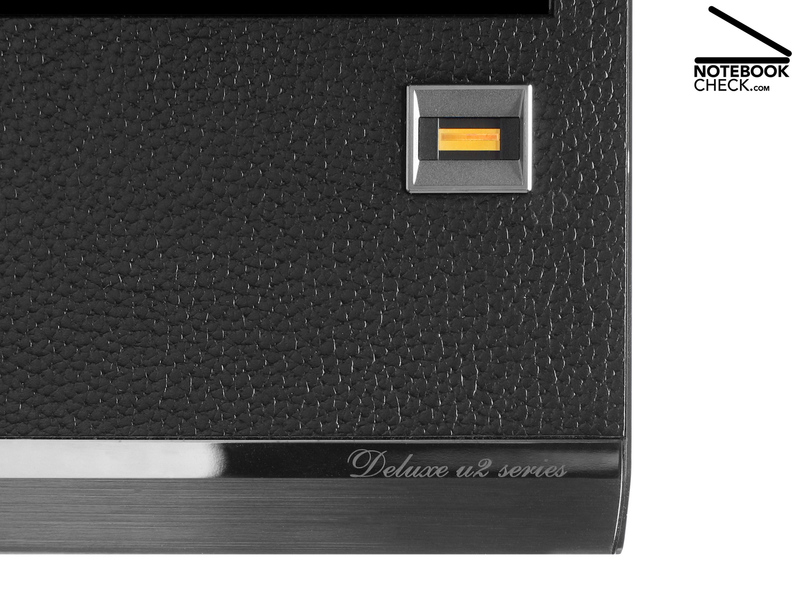 But, the bottom side of the Asus U2E gets clearly hotter. The average temperature was 38.3°C there, the measured maximum temperature was 46.5°C on the underside. 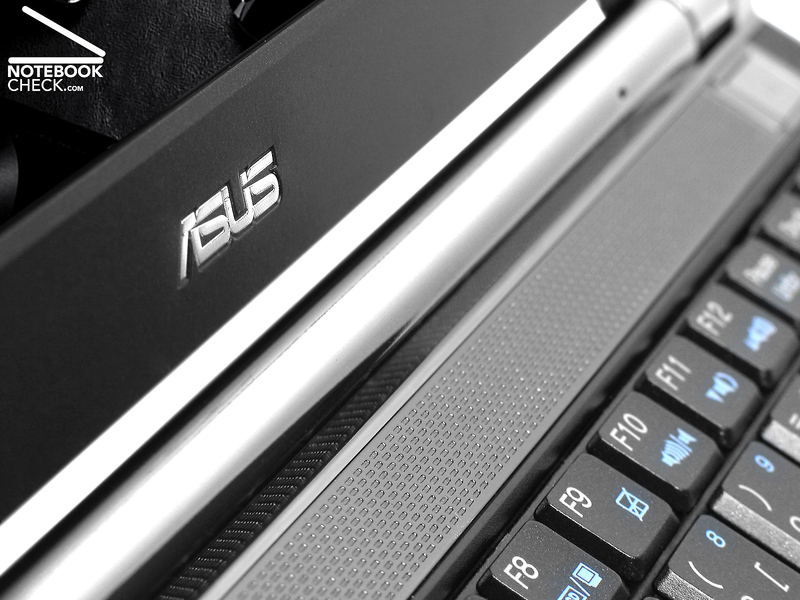 If you work with your light Asus U2E on the top of your laps for a longer time, this can get quite inconvenient. 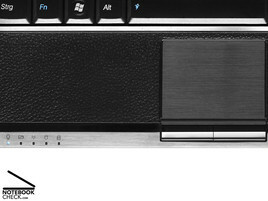 The loudspeakers of the Asus U2E are integrated in its front side. Disadvantage: Both of them are too close to each other. So, even because of their location you won't really get a stereo sound. Anyway, you'll rather want to do it without their thin and tiny sound. The sound output of the analogue headphones port sounds very good. We even liked the sound via our reference headphones, Bose In-Ear headphones, in music videos and DVD films. Despite the rather powerful components, the Asus U2E turns out to be rather energy-efficient in mains operation. Although the Asus U2E demands with all energy-saving settings switched on and dimmed screen still more energy than the less powerful netbooks (MIDs, UMPCs), the energy demand of 12.6 to 18.2 Watt while idling under Vista is absolutely alright. A striking detail: Even with the integrated X3100 graphics chip, a 3D text screen saver clearly increases the energy demand in idle mode by 5.3 (!) Watt (23.5 Watt). If you turn on all additional built-in electronical features like WLAN and Bluetooth and choose maximum brightness, the energy demand of this noble mini notebook increases to a maximum of 33.5 Watt. Asus even provides two batteries for working on-the-move. You can either use a 180 gramme light battery with 27 Wh or a 324 gramme 53 Wh battery. 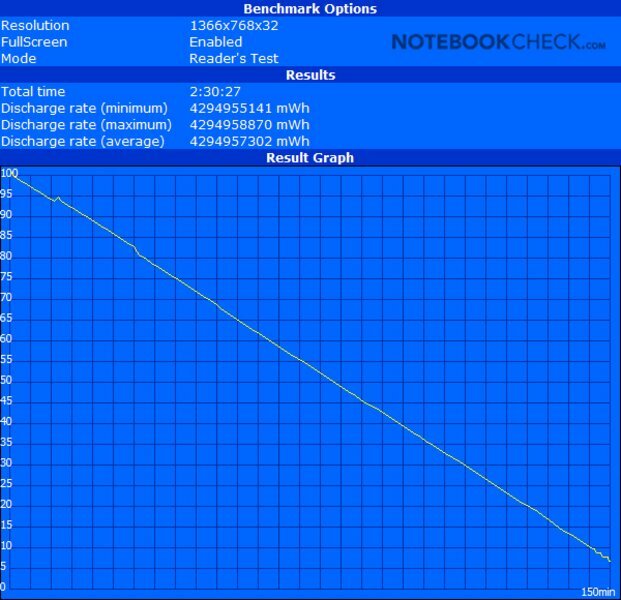 Therewith, the Asus U2E achieves a runtime of 7 hours and 45 minutes (both batteries) in the Battery Eater Reader's test. In the Battery Eater Classic test the runtime of the Asus U2E shrinks to about 2 hours 42 minutes if you use both batteries. The U2E, presented by Asus, is with 1.3 kilogramme a light and very compact noble subnotebook in a noble black leather cover. 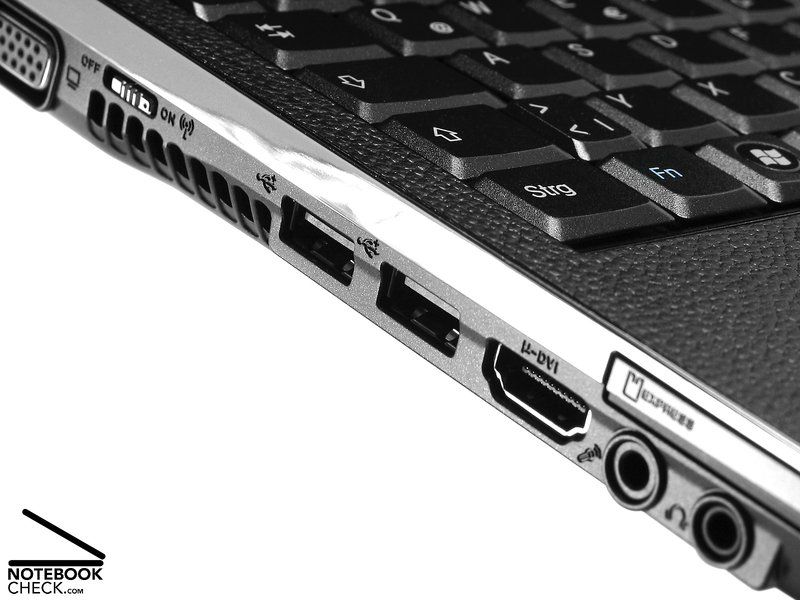 During our review the Asus U2E convinced by exclusive materials and a perfect workmanship. Considering it is an ultra portable notebook, the Asus U2E offers many interfaces, including a mini DVI port for an external flat screen. 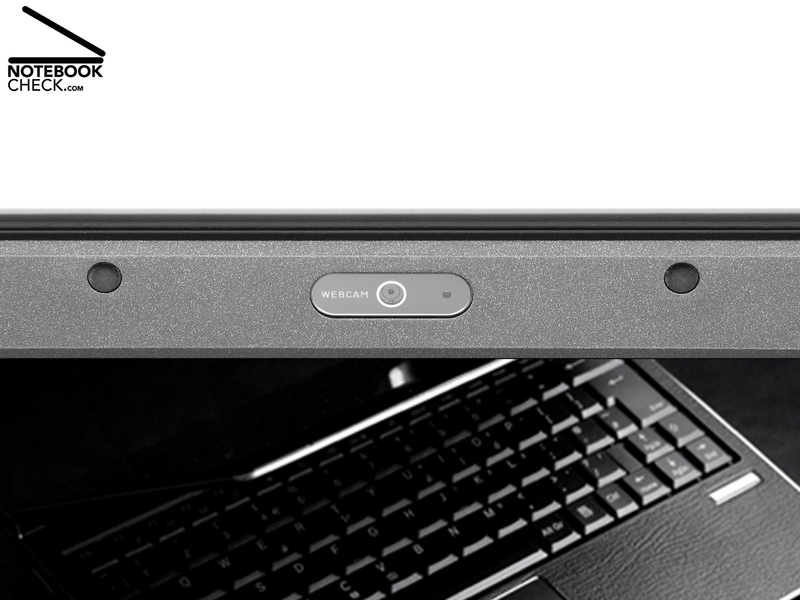 The Asus U2E even has a built-in, and even fast DVD drive for DVD entertainment on-the-move. In addition, the Asus U2E of the ultra portable category, implements a number of useful security features, e.g., a TPM security chip and a fingerprint reader. Regarding communication equipment it scores points by 300 Mbit WLAN, Bluetooth, and Gigabit-LAN. 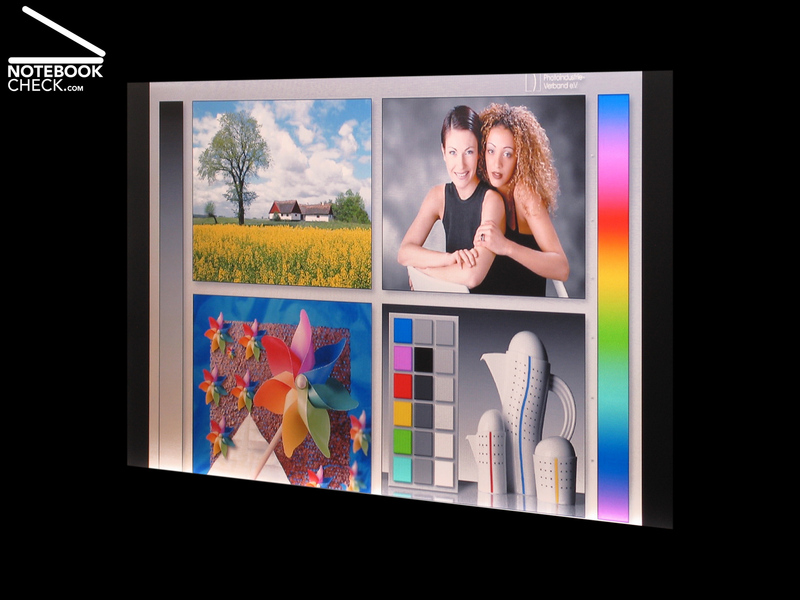 The screen also convinces by a very even illumination and an excellent contrast. Furthermore, many accessories including Bluetooth mouse, two battery, and recovery CDs/DVDs, and 24 month warranty are included. So, the Asus U2E gets a very good score in the total rating. There are only some disadvantages of this 11 inch subnotebook: The next generation could additionally provide fast Internet access via HSDPA. Furthermore, the temperature and noise emissions should be improved. Finally, we would like a slightly faster hard disk. If you do not mind the system noise, you'll get a high-quality luxury subnotebook in pocket size for about 1400.- Euro at the time of writing. ... and partly available for less than 1400 Euro! The picture quality of the 0.3-MP webcam is not really outstanding, but, sufficient for video chats. The Asus U2E polarises opinion, but, is without doubt a very special subnotebook. Unique: The U2E integrates DVI as μ-port, although it is only 11.1 inch small. The precise fit of the parts is impressing, but, the indicator LEDs are rather small. Made of stainless steel: Also the touchpad looks exclusive. It features a good grip, precise reaction, noble and solid appearance, and relatively quiet buttons. It's hard to believe, but this noble mini notebook actually comes with built-in TPM (Trusted Platform Module) and fingerprint reader - super! ... the power switch also shine in stainless steel. ... and the inside areas are covered by black cowhide. The manually buffed frames made of rustproof stainless steel are other eye-catchers. 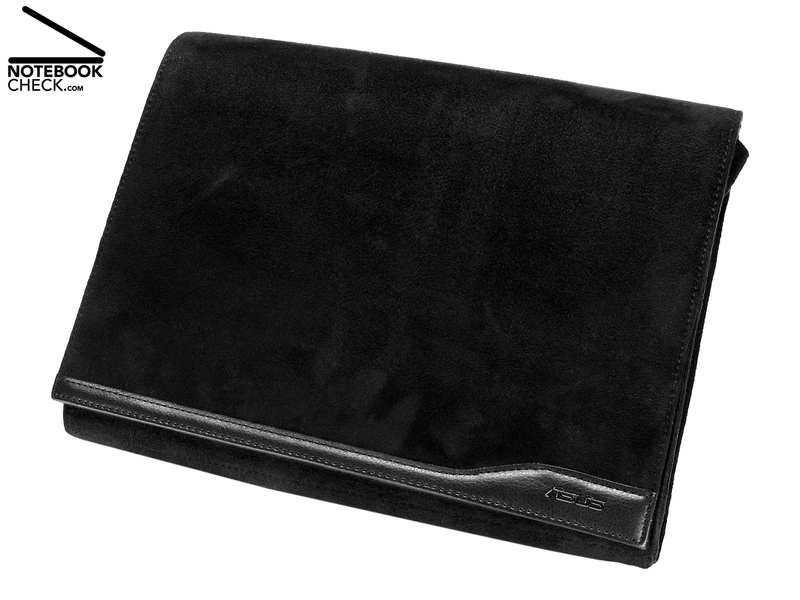 Asus even remembered to include a simple, yet elegant notebook bag for its U2E. ... whose underside shows that it is a Logitech-OEM product. ... wireless Bluetooth mouse in an elegant bag. 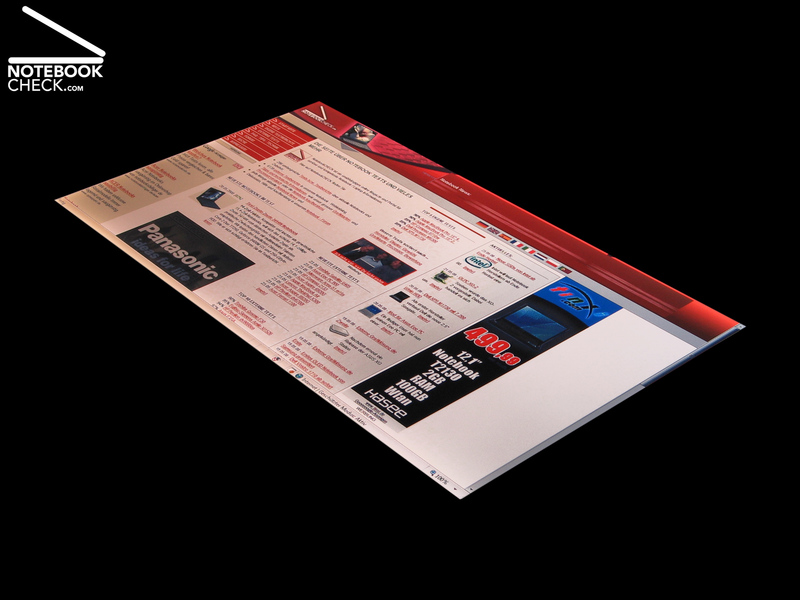 Dead end: It is impossible to access anything from the underside - look beneath the keyboard. How can one clean the fan?